Douglass also so learned that there was much work left to be done. The slave owners had been forced to give up their chattels and were not likely to accommodate the process of helping them to adjust to a free life style. In fact there would be nothing they would rather see than to witness the failure of the emancipation process. He felt that the right to vote was the first step for his race to begin to control their own destiny. The question arose as to how a race that was kept in ignorance through slavery would be able to make intelligent choices at the polling station, but Douglass saw this as a question of how his people could get an education if a race of people determined to keep them in ignorance controlled the government. History has taught us that it took more than 100 years to work out these difficulties. In the 1960’s southern states still found ways to keep the black population from voting. In 2016 the world has not yet fully recovered from the devastation caused by the slavery system. Still the rich will oppress the poor and use their wealth to control the government to be sure the poor do not get a say. The above quote shows that the insights of this brilliant man have yet to be regarded. Will it every be safe to leave a lamb under the power of a lion? Can we ever say the capitalist will honour the rights of the labourer? Will the rich ever take it on themselves to assure the safety and wellbeing of the poor? Frederick Douglass clearly saw that this could never been done by force. It will take enlightened moral conviction to convince the oppressor to oppress no more. Greed was at the heart of slavery and greed still afflicts mankind. This is a great social illness and the world can never enjoy tranquillity until it is cured. The oppressor constantly lives in fear that the oppressed may rise up and overthrow his power to oppress. Insurrection was the greatest fear of the slave master. A well maintained legal system was required to keep their subjects in ignorance and poverty. Still the rich exert their influence to keep the legal system to their own benefit. The God of hope is thrown out of the market place, the government, and the schools, while the god of money takes over and rules the world. “In God we Trust” is captioned on the American currency. “In money we trust” is embedded in the understanding of capitalism. Such a decease as greed needs an Great and All-Powerful Physician to cure it. It seems strange that while the USA was fighting their civil war, in the east such a Physician was announcing his presence amidst a background of turmoil. 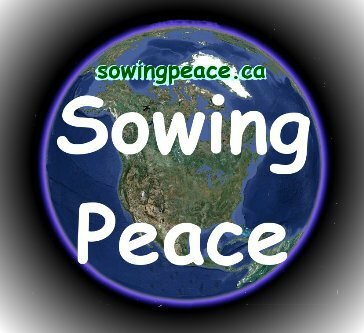 The earth was suffering great birth pangs as the new world order was being born. As lightening it flashed from the East and was announced on the American Continent in 1892. It spread rapidly throughout the world, yet the masses have not yet heard of it. In the west this Divine Physician is known as Bahá'u'lláh and His followers are desperately trying to spread His healing message. Yet the illness of greed lingers and resists their efforts. Society has become as the dog in the learned helplessness experiment. “Nothing can be done” is the resounding cry of both oppressor and oppressed. The oppressed fear the oppressor and the oppressor fears losing control. The oppressed have no opportunity to contribute to society and all of society is held back by the lack of these contributions. Thus we all suffer from the lack of this remedy. Yet the remedy is readily available for any who want it. 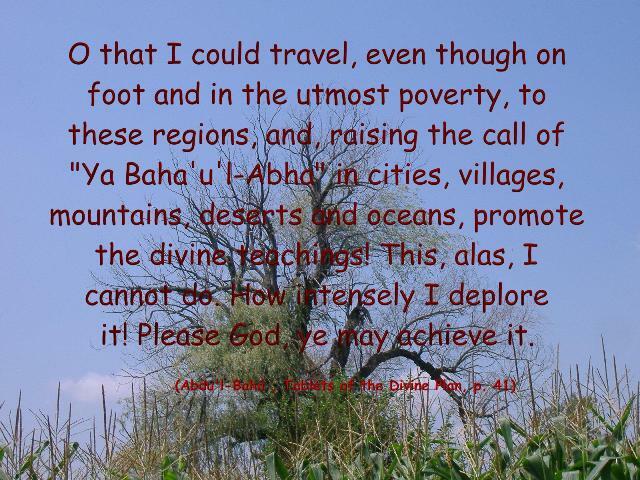 There are more than 5 million Baha’is in the world that want to tell you of it. They are seeking out those who want this cure. I find it very interesting that in every family the children are taught to cooperate with one another. However the family of mankind seems to have forgotten this lesson. Within the family it is proven that cooperation yields much better results than competition, yet the society we live in has become so competitive that there are many losers. The winners in the competition can afford many luxuries but have to work so many hours they get little chance to use them. The losers can’t get work to earn enough to buy such luxuries. In one part of the world tons of food goes to waste and people are dying from overeating. In other parts of the world there is a shortage of food and people are dying of starvation. Yet the capitalist can make more money producing addictive foods that don’t meet our nutritional needs. If eating were to satisfy our hunger we would not buy so much food and the capitalist would not make as much profit. It is said that, when we need minerals, we crave sweet foods that are naturally high in minerals, but food producers have found ways to make sweet foods with very little mineral content, so the craving for sweets never goes away. Thus the competitive society, whose reward is the almighty dollar, does not have the wellbeing of the individual in its best interest, yet society is a collection of individuals. What is the answer? There is none that mankind can come up with. Left up to man, society is doomed. However, we have a loving Heavenly Father that only wants us to turn to Him for guidance. He has sent us the Divine Physician with the cure to all our ills. We have but to listen to Him and allow the transforming power of His words to purify our hearts. However, greed has set a trap even here. Has not religion been the cause of war and bloodshed? Have religious ideologies not done more harm than good? These questions cannot be taken lightly. It has been greed of power that has caused division in religious societies. All want to promote their own ideologies and tamper with the Holy Words in order to promote their own interest. Religion, in its pure form, is very powerful, but it only has the power to do good. However, watered down religion can still have a powerful effect. Put in the hands of capitalists, it can be very marketable and make much money. In the hands of leaders drunk with power, it can create a huge following. Thus this great good can become a great evil. The greatest evil has been the religious leaders who try to prevent the people from recognizing God’s latest revelation. Since I came from a Christian background I will refer to that history, however every religion has similar stories. When Christ Manifested Himself to the world, the Jewish leaders arose in mass to prevent Him. They threw every obstacle in His way. They denounced Him as a liar and a blasphemer. When all else failed they had Him crucified. Yet that did not prevent His religion from spreading. Had these religious leaders been in tune with the Word of God, they would have immediately recognized the Majesty and Power of the Words of Jesus. The humble easily understood what the proud could not. It seems always that the humble sinner is called while the proud and self righteous are left to their own devises. God has not left us and only desires that we humbly turn to Him. Yet the evil one has put so much fear of religion in the minds of men that there are few who will take the step to search that possibility. Mankind is desperately seeking answers but way has become veiled. The Sun of Truth shines brightly but obscuring clouds hide its splendor. Soon the clouds will be dispersed and the Glory of God will shine through. Well is it with those who seek Him out before that day comes. 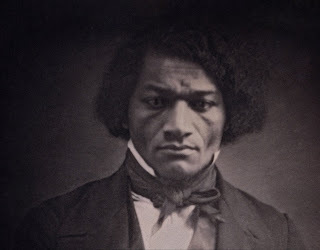 1818: birth of Frederick Douglass. Endures both the best and worst that slavery has to offer during the first 20 years of his life. Longs to be free through all of it. 1841: Speaks at the grand anti-slavery convention in Nantucket, under the auspices of Mr. Garrison. His Abolition career begins. 1865: Civil war ends with the abolition of Slavery. Frederick Douglass continues to speak and write about the rights of the Afro-Americans. 1895: Death of Frederick Douglass.